I live and work in Louisville, KY but have always loved the mountains... skiing, hiking, and the cool mountain air. Owning my 'home away from home' allows me to visit frequently. An added bonus is my son and his family live in Steamboat, so I get to see my grandkids a lot! The view! Plus, it's in a quiet location, but just 1/2 mile away from all the action on the mountain. Comfy, cozy, clean, and well-stocked with everything you should need. During ski season, free on-call shuttle busses take you to and from the gondola and pretty much anywhere else you need to go within city limits. Spectacular panoramic view of the Yampa valley and Flat Top mountains 60 miles away. Fully equipped with everything you might need! 42" flat screen TV in living room w/DVR, DVD player, home theater surround sound, iPod dock. 22" flat screen TV in bedroom w/DVD player. HBO too! 2 DVD players -- one in living room, one in bedroom. Lots of CD tunes available. Movie library for all ages (over 75 DVDs; no horror or extreme violence). Rocking chairs on private balcony overlooking the view. Free on-call shuttle buses during ski season. Yoga mat and 5 lb weights in the unit. 2 hair dryers. Humidifier. 2 Thermarests. Ceiling fans in all rooms. CO2 detector and central fire/smoke alarm in the unit. My friends and I came up for a long weekend and had a blast! 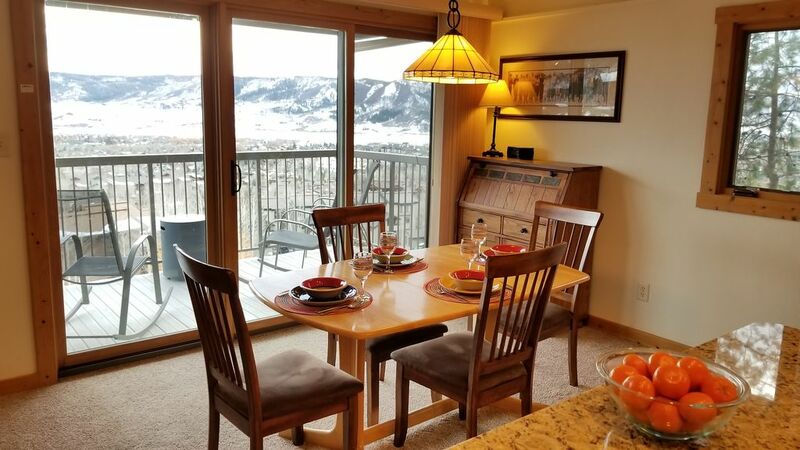 Such a nice condo with incredible views! And it's super close to the mountain. The condo was exactly as stated. The condo was perfect. It was clean and well taken care of. The views off the deck are stunning and it is very close to the gondola area. The shuttle is very easy to use and everyone was very friendly. It was so nice to have paper towels, coffee, hand lotion, and bathroom soap to use. Also, all the instructions in the condo regarding heat and the use of the tv and DVD player were easy to understand. We would definitely stay at this condo again. Thanks, David, for the wonderful comments and truly hope you enjoyed your stay! I'm wondering though what caused you to give me only one star. What could I have done to make your stay better? We enjoyed our stay immensely. Every comfort of home is in place and the view is breathtaking. The ski shuttle arrived within minutes of our call from the condo, and that was a huge bonus. Ann was highly responsive to our questions and was an outstanding host! Beautiful condo and beautiful stay!! home and not a vacation rental. We have stayed in many places in Steamboat, on and off the mountain, over many years and this was by far the very best! The condo provided the necessary elements for an enjoyable experience. The view from the deck was great especially at night. Also, the transportation services were the finest I have had anywhere. The mountain skiing was epic.